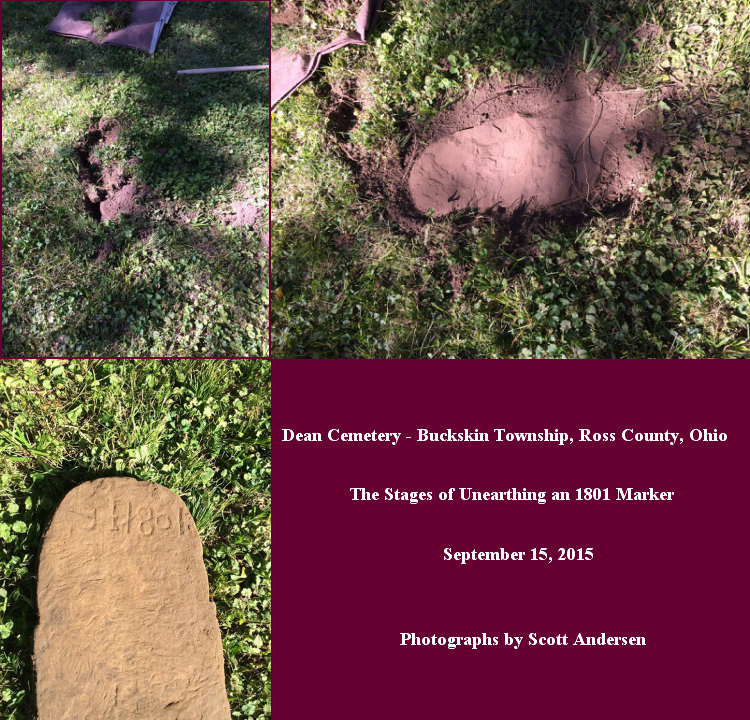 September | 2015 | "Limesstones"
Thanking Scott Andersen who shares these new “Before and After Cleaning” photographs of white marble markers set in slotted bases at the Old Burying Ground in Greenfield, Highland County, Ohio. Infant, son C. W. and S. A. Templeton; Ezra Lucas; Catharine, wife of James Lucas; and James Lucas. 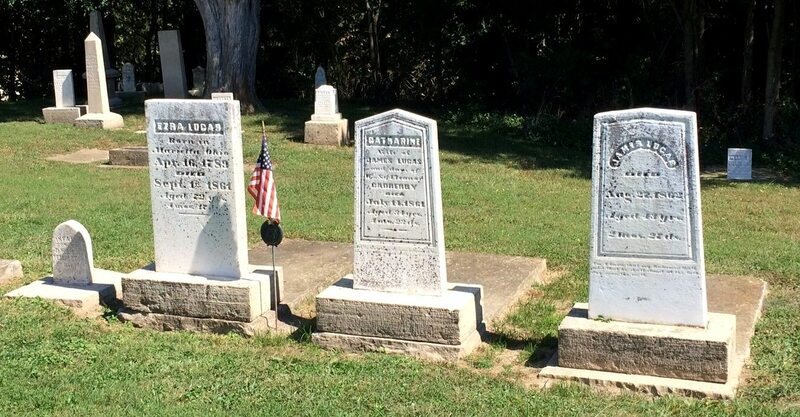 These headstones were cleaned by Geneva Weaver, her sister Phyllis, and Jacquelyn Doles just over a month ago. Be sure to check out the calendar on the website of the Greenfield Historical Society for information about upcoming work sessions conducted by volunteers working in this their second year. The Old Burying Ground is Greenfield’s oldest cemetery where many of its earliest pioneers were laid to rest. Original headstones mark their graves. Most have long needed extensive cleaning, repairing, and re-setting. The results are strikingly clear. This all-volunteer group of historical society members and concerned folks who want to join them are getting the job done one grave marker at a time; making great strides by advancing row by row. 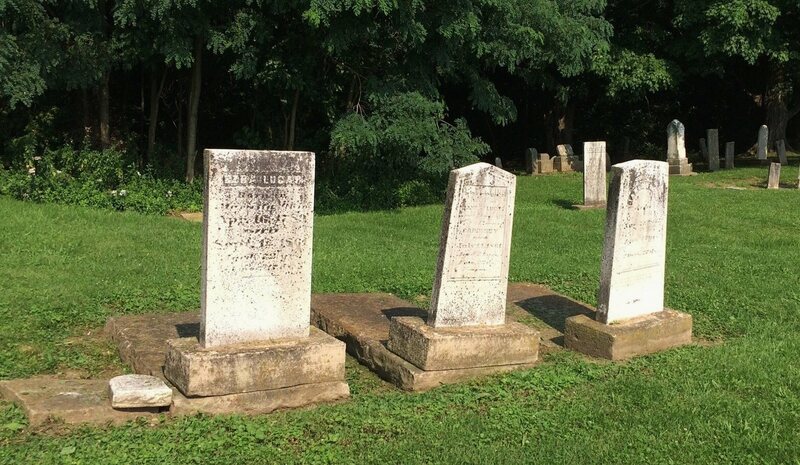 Their organized planning and caring hands approach have truly transformed this once neglected and deteriorated cemetery that has silently sat on the Paint Creek’s western edge for well over two hundred years. Sharing this story from the “Columbus Dispatch” from September 15, 2015. Harvey Edward Estel Limes was born on May 20, 1843. He was the second oldest son of Harrison Limes and Eliza (Aber) Limes who were married on April 7, 1841 in Highland County, Ohio. Page 813 of he book, “History of Fayette County”, by R. S. Dills – 1881 – includes Harvey E. E. in the write-up about his father. Harvey’s paternal grandfather was War of 1812 veteran William Limes (1778-1863) who was buried at Walnut Creek Cemetery, Perry Township, Fayette County, Ohio. Harrison Limes, Harvey’s father (1816-1888) was buried at Cochran Cemetery in Fayette County. The brothers and sister of Harvey E. E. Limes were: William II, Harriet Ann, Charles W., Hannah R., Winfield Scott, and Atha Eliza J. Sergeant Harvey Limes served in the Civil War in the 73rd O.V.I., Co. “G” along with his brother, William II. Harvey enlisted twice, November 6, 1861 and was discharged on a surgeon’s certificate on August 27, 1862. He enrolled again on January 16, 1864 and was discharged on July 20, 1865 at the end of the war. His war papers list him as being born in Fayette County, Ohio and having black eyes, black hair, 5’ 9” tall; a farmer, and a resident of Perry Township, Fayette County, Ohio. On October 31, 1869, Harvey married Nancy Jane Stansbury of Illinois whom he met while visiting an army friend there. Harvey E. E. Limes passed away on December 10, 1917 in La Harpe, Kansas and was buried there. His wife, Nancy Jane, died on May 7, 1934 in La Harpe, Kansas. If You Suffer from Back Pain, Have Had an MRI, and Learn You have “Tarlov Cysts” (AKA Perineural Cysts) – What Should You Do to Better Understand Them? If you suffer from back pain (possibly low back pain); have had an MRI test conducted on the Lumbar area or possibly other areas of your spine — PLEASE request a written copy of the results of your spinal MRI — even if the doctor says your results are “Normal”. After reading through the results, if you see “Tarlov Cysts” or Perineural Cysts mentioned in your report; but no other description about them — such as their exact size, exact number at a specific location, then please call your doctor and ask him or her to contact the radiologist to have them amend your MRI report to include those details, and obtain the revised report with that information. This information about your “Tarlov Cysts” is important for you to know. However, it has been shown that Tarlov cysts can cause pain primarily if the person has experienced some traumatic event. This type of trauma would include such events as falling or being in a vehicle accident, or even picking up heavy items. I feel it is good to know these things as it can help you with your daily activities and make decisions about what to refrain from doing, and being more careful with your walking so you don’t fall. There are other Facebook Groups whose focus is “Tarlov Cysts” that can be explored as well. Link to “Clinicalgate” and their article about Tarlov Cysts. “Tarlov cyst is a bulbous enlargement of a spinal nerve root cerebrospinal fluid (CSF) space that is distinct from other meningeal cysts, such as dural ectasia or meningeal diverticula. Tarlov cysts most often are found in the sacral spinal canal, where they can produce bone erosion and compression of adjacent spinal nerve roots, resulting in a debilitating sacral radiculopathy syndrome.